Pretty simple not much going on there, getLayout returns a multidimensional list of numbers that represents the level, and getImages returns a list of the images used by the level. You can see that in the __init__ function the level defines three values: BLOCK, SNAKE, and PELLET. These values correspond to the numbers in the list returned by getLayout(). So wherever there is a 1 in the list, that will correspond to a BLOCK, a 0 is a PELLET, and a 2 is our snake. 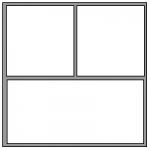 In this example I use 9 to represent a blank square. You’ll also notice that the getImages() function returns a list of images that are indexed by those same values. So in the list returned by getImages(), position [BLOCK] is the block image. As you can see all that basicSprite.Sprite does is really add a few initialization values: centerPoint and image. Image is the image that the sprite will use and centerPoint is the center point of the rect, it controls where the image will be placed. The nice thing about using the center point is that it is correct regardless of the images size. So if you have a 16×16 image and a 24×24 image the center point will be the same, but the topleft point (which we used in part one) will be different for both. You’ll notice that the initialization is similar to the initialization in part one except this time we are using the basicSprite.Sprite class to set up our image and rect. Then we initialize the same values, except we have introduce two new ones, self.xMove and self.yMove. The reason for this is we are going to change the way that we move our snake. If you tried out the last tutorial you’ll see that just moving the character on the key down events didn’t work all that well. It worked well enough but if you start pressing more then one key are the same time pyGame seemed to get a bit confused. In order to combat this we will use another tip taken from the DevShed tutorial and pay attention to both the DOWN and UP events associated with keystrokes. We will also switch to using the update() function to update the snake. As you can see when we press the K_LEFT key down we add -x_dist pixels to the xMove variable. This will then be used to move the snake in the update() function. Then when we let up the K_LEFT key we remove the -x_dist values that we added to xMove. For example if you hold down K_LEFT for a moment xMove will before -3 (move three pixels to the left every time the update() function is called), then when you let the K_LEFT key up xMove will become 0 (don’t move). Now the update() function is function in pyGames Sprite class. It really doesn’t do anything besides providing a convenient way to update a group of sprites. It will also pass the same parameters to all of your sprites in the group. So if you have a bunch of sprites that need to know the current time when you update them it’s a good idea to add them to the same group and then update them all at once by calling the group.update() function and pass the time. You’ll also notice that there is a second parameter passed to this function called block_group, this is the group of all of our block sprites. We use that group to do a hit test. If the snake has collided with a block after we have adjusted it’s rect, we reverse the movement. Since this function is a bit more complicated I will try to explain it in more detail. The first thing that we do is calculate the x_offset and the y_offset, using the value BLOCK_SIZE. BLOCK_SIZE is simple a global created in pyMan.py that refers to the size that each block will be. So in this case, BLOCK_SIZE = 24. The x_offset and y_offsets are the center points of a block. We use these offsets to position the sprites that we will create. After that we load the level: we create an instance of the level001 class, and then get it’s layout and it’s image list. Then we create our pellet and block groups, these will be sprite groups that contain all the pellet or block sprites. The next step is to loop through the layout of the level and create the necessary sprites at each position. We first calculate the current blocks center point, just to make the code a bit cleaner, and then we check to see what the current position in the layout is. It it’s a BLOCK position we create new block sprite and add it to the block_sprites group. If it’s a PELLET position, we create a new pellet sprite and add it to the pellet_sprites group. The only sprite that we treat a bit differently is the snake sprite, since we will only have one snake per level, we only create one. And if the level designer mistakenly added two snakes, we will use the second snake as the snakes position. You’ll also notice that both the pellet and the block sprites are simply basicSprites.Sprite’s since they don’t really do anything else besides get drawn to the screen. It’s a lot of code, but it’s not really that different then the code was in part one. An obvious difference is the way in which we adjust the snakes position, using the MoveKeyUp, MoveKeyDown, and update function. Everything else is basically identical to the way that it was in part one. The only other difference is the fact that we have to draw the block sprites. Since the blocks are static and will never be updated, we are going to draw then to the background surface. This will save us a bit of drawing time when we draw. When we run the code now we are greeted with the simple PyMan level that we saw at the beginning of this post. Now this isn’t close to being a finished game as there is no level two, and there are no bad guys, but our simple game it starting to take shape. In the next part of this pyGame series I hope to add the bad guys to the level and the idea of the super pellets. If you want to download the code for this post you can do so here. File “C:\Documents and Settings\GUILHERME\Desktop\game.py”, line 9, in ? which directory should be the file “ball.bmp”? ball.bmp should be in the same directory as your game.py file. actually, it depends; on your system it could just as well be that the BMP is expected in the working directory from which you run the script. which is bad … that code is just wrong, overly simplistic. of course if you run it from a shell and first cd to where the file is, no problem. but it’s wrong to assume that this will always be the case. You are very correct, there should be more work done to determine the location of the image file. Sadly this is an old tutorial and I was still learning python (and I still am) as I was writing it. my IDLE can`t fin the modul levelBase. Try writing your scripts into a .py file (located in the same directory as the levelBase.py file. That should solve your problems. Have you ever used ‘surfarray’? And have you ever made a program where the background scrolls under the character in the center? I’m still getting used to a lot of pygame functions and I’ve been trying to pull bits and pieces of ideas from your ‘pyman’ tutorials. My head hurts after a while, especially when I think my code should do something but it doesn’t. Do find that it works well for you to use separate files? I’m just not sure how values get shared between files because I’m not seeing a lot of return functions. I have not used ‘sufarray’ yet, and I’ve never made a side scrolling game yet. It’s something that I’ve wanted to do, but lately I just have not found the time. I like using separate files more and more now to keep my modules organized. You share values between files in the same way that you do between classes and modules, just pass them in. I really enjoyed your tutorial, I’ve been using python for a while, but am new to a lot of the add ons, such as pydev for eclipse. The reason i like your tutorial, is because its written at ground level, and straight to the point, without all of the mindless jargon, to show off. I was wondering if you ever considered going into more detail on using eclipse, because with that information, this tutorial would be a complete walk thru for us eclipse beginners. Thanks for the kind words. I would consider going into more depth on how to use Eclipse, except for the fact that I no longer use Eclipse! I liked Eclipse well enough, it’s just that I found it to be slow after a while. I’ve been doing most of my current programming on Linux and have started using Geany as my IDE. Thanks for the idea though I may look into it. all I need for it all to come together is a gravity function. it needs to check for an empty square below the player and if so fall at speed but if there is some thing below the player(like the blocks) stop him. Hmmm, I get a CRC-error when I try to unzip this project. Thanks for the information I just tried this out on my system here and I am getting a CRC error as well. I think the contents of most of the project should be all right though. I’ll try to look for the original zip file. Hi, I compiled the game and ran it, but the snake was going too fast. I even made x_dist and y_dist to 1, but it was still moving very fast. When I had a look at your one I noticed there was no frame rate set on it. Never mind about the previous problem I had, I fixed it with using pygame.time.wait(16) as the first code in the main loop. Why do you create a group for the snake sprite? It’s just one sprite? 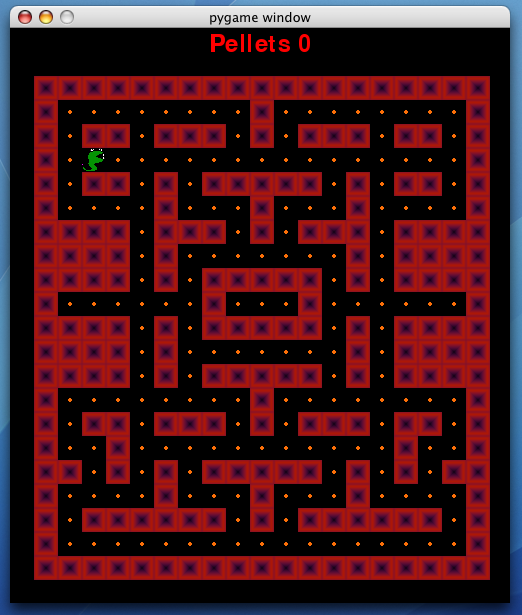 can you please help with the idea of creating a reflex action using pacman to eat all the food in the pellet and yet don.t get beaten by the ghost, say two ghost. I would need your assistance in python.